The goal is to fit the puzzle pieces into their proper position in the square to reveal a quotation. The 4x4 blocks of the square are identified by a letter-number combination (A1, A2, A3, etc.). The quotation will read left to right, line by line. A black square indicates the end of a word - words do not necessarily end at the end of a line. Punctuation such as periods and commas is already supplied. In the puzzle below, the upper left quadrant A1 contains only one cell in which a single letter can be placed, so the letter 'F' must be placed there. 'F' will be followed by 'AIL' in quadrant A2. The interactive solver lets you solve the puzzle in your web browser. 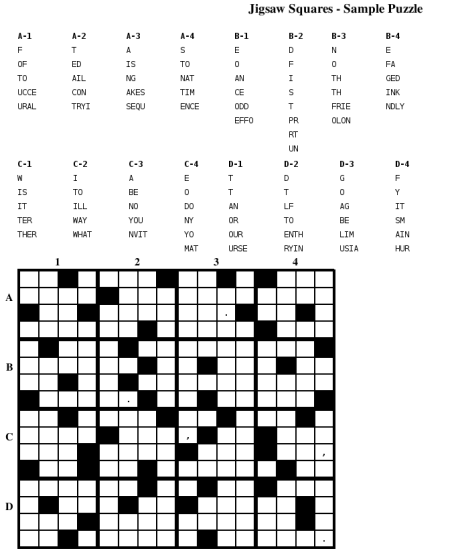 The Solver appears with the letter "pieces" on top and the puzzle grid below. Click on a piece to select it (it will turn yellow). As you hover the mouse over the puzzle grid, the eligible cells are blue colored, illegal placements are shown in gray. Click on a spot in the puzzle to place the selected piece in that location. If you change your mind, click on the puzzle and the piece will return to the top area. If you correctly place all the pieces in their proper position in the puzzle, you'll be able to read the complete quotation, and a small congratulations dialog will appear.